This is my card for today's Clean And Simple Challenge "Here Comes The Bride"
I wanted to use my new punch that was RAK from my wonderful friend Dawn (flowergal36). So this card was built around that. And I wanted some color, thus the pink. Also I got to use my new butterfly punch for the first time, from another dear friend, Kim. Thank you Kim. Thank you for the challenge: Jen, Ryann, Patty and Miss Boo. 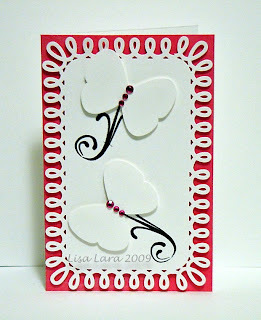 OOOO Lisa this is beautiful, I LOVE how you used this punch...The bling and border is AWESOME!!! Beautiful card! It turned out awesome Lisa. I just love the way the border punch looks. The white on white is very striking. I am so happy you like it..Hugs..
Great card and I think your blog is wonderful!! I love all the white as it makes for a very beautiful card. Great job on using the loop punch too!